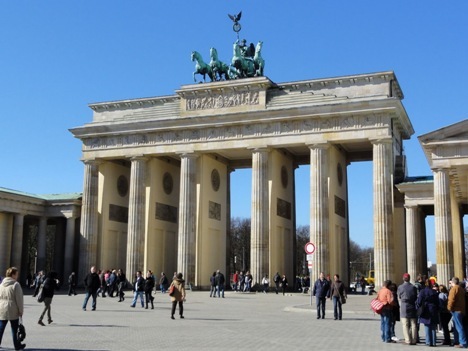 Brandenburg Gate, the symbol par excellence of Berlin, so should not be missing in your travel books. Previously symbol of the division of the two Germanys, has now become a symbol of unity, as well as being a magnificent example of neoclassicism. Recall that the twelve Cologne support the door at the top is the Quadriga, the goddess of victory, riding a chariot with four horses. Also take a few snapshots to Pariser Platz, concerts are often held here. If you love art, then, do not forget to visit the East Side Gallery: practically this art gallery comes from a long stretch of the Berlin Wall was still standing, full of all the murals to be photographed. Remaining on the subject of museums, we find the Pergamon Museum, with works from ancient Greece, Babylon, the Middle East and even the Roman Empire, including the Pergamon Altar, the Ishtar Gate of Babylon and market gate of Miletus. If you prefer contemporary art, then the Hamburger Bahnhof is what it does for you: here you will find works by Andy Warhol, Roy Lichtenstein, Keith Haring and Anselm Kiefer. Also admire the structure: it was once a train station. And again, please also visit Judisches Museum, where you can review the history of the Jews in Germany. Another museum that we recommend is the Neues Museum which exhibits artifacts from the Egyptian art also the famous bust of Nefertiti. Do not miss the Holocaust Memorial, a memorial dedicated to the Jewish victims of the Holocaust. If you are more interested in the cold war, then you must go to Checkpoint Charlie; at the moment here is a gatehouse of the American army perfectly reconstructed in detail. Another point of interest is the Reichstag building, which is the seat of the German Federal Parliament by the impressive glass dome, remember to take the elevator to reach it, it’s worth it. If you prefer to spend a few hours in the green, then you have to go to Tiergarten. Get your camera ready, because here expect streams, ponds, woods and picturesque paths. If you’re more interested in modern structures, you could take a look at the Fernsehturm TV Tower. You can also climb to the top of the lift by serving and photographing the scenery.